So for those curious how this works, I just got this and I did some testing. There is no cooldown. You can cast it and use it as many times as you'd like. It does not affect the cooldown of your Garrison Hearthstone in any way. Vivianne casts the portal just like a mage. You right click it, do a quick cast yourself, and you port. As of right now, anybody can use the portal to go back to their Garrison. That means people both in your group and those not in your group! Only the owner of the follower may create the portal by right clicking her. Nobody else can actually open it but you. If somebody right clicks their portrait and selects "View Leader's Garrison," the portal will not work for them. Only if they are porting to their Garrison can they use it. The screenshot below just shows me getting the spell from the quest, using the portal by myself, someone in my group using it, and my Vivianne's attributes. I should also mention the same goes for Aeda Perk: Ritual of Summoning. Anybody can use it whether in your group or not. I have just reached 3/3 Friendship with Vivianne on my level 96 warlock. However, I see no quest, when I talk to her she does not offer a portal, and I have yet to see her cast a meteor in combat. I can only conclude that both abilities are only unlockable at level 100. Please feel free to confirm or point out if I am somehow mistaken. EDIT: Why downrate for accurate information? Neither the tier one nor the tier two abilities are available without being level 100. To add on to my statement, I reached 100 recently and both the meteor AND the portal quests appeared instantly. Accurate information; both friendship level abilities become available at level 100. You CAN raise your friendship tiers ahead of time but you won't receive the benefit until you've maxed your level. It doesn't work while Vivianne is mounted. 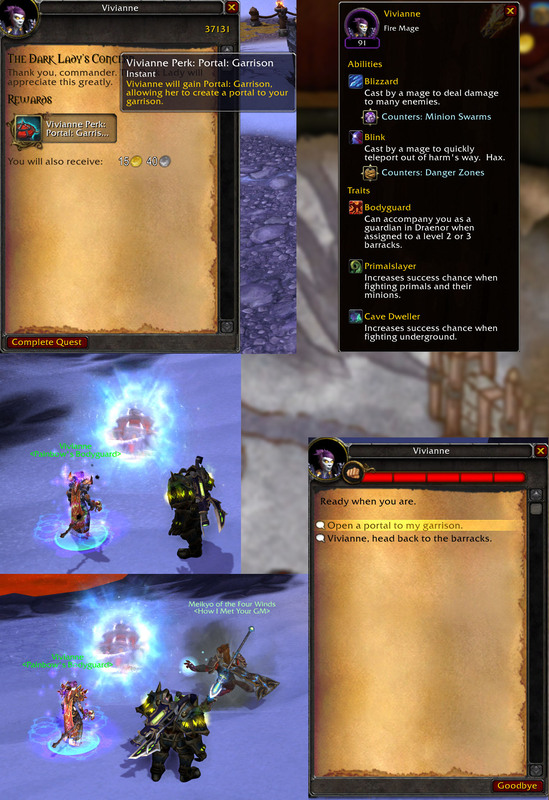 Vivianne will gain Portal: Garrison, allowing her to create a portal to your garrison.